This guide will help you get a set of users up and running so they can explore Calling Plans in Teams. We recommend that, in parallel with this quick-start guide, you read Phone System with Calling Plans and FastTrack to plan and drive a successful rollout. By adding Calling Plans - an Office 365 feature powered by Skype for Business - you can now use Teams to make and receive phone calls to or from land lines and mobile phones via the public switched telephone network (PSTN). To enable the Calls tab in Teams users need to have 1:1 calling enabled in Teams and using a Teams client that supports 1:1 Teams calling. To learn how to manage 1:1 calling in Teams, read Set-CsTeamsCallingPolicy. 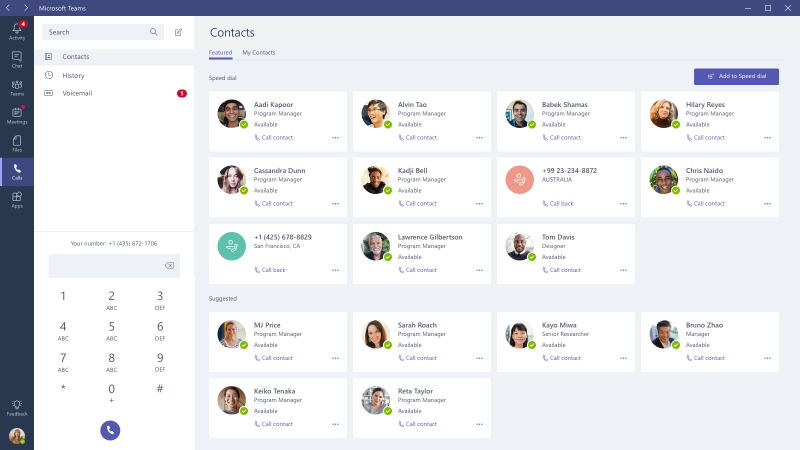 To learn which clients support calling, please read Limits and specifications for Microsoft Teams. Currently, Voicemail will not be available in the Calls tab unless the user is enabled for PSTN calls. To enable the Dial Pad tab in Teams and allow your users to make and receive PSTN calls you will need to provision users for Phone System and Calling Plans. To learn how to set up Calling Plans, read Set up Calling Plans. You can also use Direct Routing to allow your users to make and receive PSTN calls. To learn how to set up Direct Routing, read Configure Direct Routing. To control whether incoming calls (and chats) land in Teams or Skype for Business, administrators use TeamsUpgradePolicy, using either Microsoft Teams admin center or using a remote Windows PowerShell session with the Skype for Business cmdlets. Incoming VOIP calls that originated in Skype for Business always land in the recipient's Skype for Business client. Incoming VOIP calls that originated in Teams land in Teams, if the sender and receiver are in the same tenant. Incoming federated VOIP (regardless of which client originates) and PSTN calls always land in the recipient's Skype for Business client. Skype for Business IP phones will receive calls, even if the user is in TeamsOnly mode. Users that have been provisioned with Phone System and Calling Plans licenses for use with Skype for Business Online (e.g. they have been assigned a value of OnlineVoiceRoutingPolicy) , will have the Calls tab enabled in Teams and can place outbound PSTN calls from Teams without administrators having to take any administrative action. תוכל גם להשאיר משוב ישירות ב- GitHub .